If you are a parent who has yet to acquire a cell phone, set the timer on the VCR, or who is unaware that most people no longer use VCRs, you may wonder how assistive technology could fit into your life. After all, you may have never even used a computer much less taught a child how to use one. This is sometimes referred to in the media as “the digital divide,” where due to social, economic or educational circumstances, a person may not have access to technology. Any parent might feel guilty at not being able to provide the very best of everything to their child, but for a parent of a child with a disability, the intimidation factor of assistive technology may add to their feelings of helplessness or inadequacy. Here are a few tips that will help you to demystify Assistive technology. Not all assistive technology devices are computer related. There are high tech, low tech and no tech options. As a person who is blind, one might think my home is outfitted with every technological wonder, and it is. Yet, I find that some of the most useful assistive tools I use do not even plug into the wall. Many assistive devices for children are much more like a cool toy than any whizbang high-end computer. They are fun to play with and easy to learn. They speak, they provide various types of stimulation, and they are specifically geared toward particular developmental or mobility needs. Where does one go to learn about AT options? I suggest beginning with some reading material, specifically a catalog. There are some wonderful online companies that provide independent living aids, assistive and augmentative devices and various mobility products, and many offer print catalogs. If you are not computer literate, find a friend who is or go to your local library. Many libraries have workstations for the general public, and if a staff member is available, ask for assistance surfing the web. Jot down a few phone numbers, then call and request that you be added to their mailing list. Another great place to get tons of information and hands-on demonstrations is at an assistive technology conference. I’m not talking about a regular computer convention or consumer electronics show. 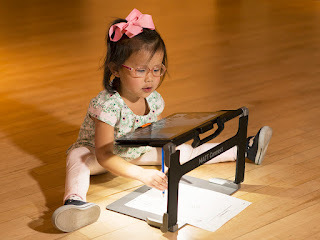 There are conferences specifically for AT, with row after row of booths, or even entire wings of convention centers devoted to devices just for children. Even if you think yourself pretty tech-savvy, you’ll be astounded at the array of gadgets and gizmos that benefit people of all ages in their day-to-day lives. There are four major assistive technology conferences each year, and a number of smaller ones. Among the most attended is a conference held in Los Angeles and hosted by California State University, Northridge. Another major event is held in Orlando, Florida. If you begin to suffer from information overload as a result of your conference experience, I’m guessing while in Orlando you will probably be able to find an entertaining alternative. While conference attendance is often open to the public, you should know that registration can be costly. However, you may be able to get a sponsor, apply for a grant or scholarship, or find a club or service organization to fund your trip. It is well worth it. You’ll be educated, inspired and very motivated to learn even more. It’s a thrill to discover how some otherwise uninteresting technological gadget can directly benefit your child. One of the most formidable barriers to assistive technology is the cost. It’s a niche market. None of the technology vendors are selling millions of these devices; however, there are ways around that. There are innumerable charitable organizations that can help with the expense of adaptive and assistive devices. Additionally, there are government programs and vendor financing programs to help offset costs. The good news is, unlike typical consumer products, AT devices have a longer life in that you are seldom required to upgrade to a newer version every few months. If it works now, it will work later. Yes, there are always newer products, but the latest thing may not be useful at all, especially since it may prove to be a frustrating additional learning process for a child already accustomed to the device he or she is using. For a child with a disability, routine, consistency and familiarity are crucial developmental factors. Take your time while evaluating these products. As in every other industry, there is a new vocabulary associated with assistive technology. Keep an open mind, but do not allow anyone to talk you into buying anything about which you have doubts. You are the authority on your child, and you know best the types of stimuli to which your child will respond well. The education gained by both you and your child will provide a quality bonding and growth experience that will enhance your lives in wonderful ways you have yet to imagine. Copyright 2010 by Laura Legendary. All rights reserved. This piece could be cut in half and each half filled out with specific places to go for AT. As it is, it is just a teaser. Wondeful things out there? Please tell us exactly where with specific recommendations. I can suggest Abledata.com, the government supported AT database. Go to the AFB Technology Talk message board, see what isthere and post your questions.